The founders of Nanoscribe developed a revolutionary high-precision 3D printing method at the Karlsruhe Institute of Technology (KIT) and quickly become the market leaders in their field. Now, the company won the Baden-Württemberg state prize for young companies. 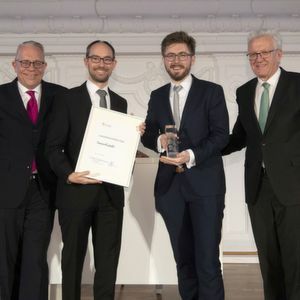 Karlsruhe/Germany — Nanoscribe, manufacturer of 3D printers for high-precision microfabrication, impressed the jury with its entrepreneurial successes and extraordinary innovations. The company was founded in 2007 as a spin-off from the Karlsruhe Institute of Technology (KIT) and quickly became a pioneer in the commercialization of a new technology called two-photon polymerization. Today, the high-tech devices made by this market and technology leader enable universities, scientific institutes and industrial companies to accomplish pioneering work. Two-photon polymerization is the key to opening up applications that were previously not feasible, particularly in the fields of photonics, micro-optics, medical engineering and communication technologies. The company was founded in 2007 as a spin-off from the Karlsruhe Institute of Technology. Emerging from a scientific niche, Nanoscribe now employs over 65 people and has established itself as the world market and technology leader. For several years, the company has posted sales in the double-digit millions, and well over 1,000 researchers and scientists at renowned universities and research institutes worldwide use their high-tech printers. The course is set for the future: Following the opening of a subsidiary in Shanghai, China, in the summer of this year, another subsidiary will soon open in the USA. The start-up is also planning to move into the new Zeiss Innovation Hub at the end of 2019, which is currently under construction outside the gates of KIT Campus North in Germany.